The Future of the Home Kitchen Is Here. Just three weeks to complete the perfect kitchen. More than 2,500 custom kitchens created or remodeled since 1992. Specializing in custom kitchen remodeling for more than 25 years. You spend a full three years of your life in the kitchen. Long Island’s Premier Remodeling Company. What started as Long Island’s premier kitchen remodeling company — creating thousands of luxury kitchens in just 3 weeks with a perfect record of referrals — now encompasses an elite team of creators, contractors and craftsmen specializing in full-service construction and completely customized ‘Design and Build’ home remodeling. Our unique ability to not just build — but also design — high quality home remodeling projects ensures customer satisfaction with work guaranteed to last. With over 25 years of experience, our reliable and friendly staff is ready to create your dream remodeling project tailored to your individual needs and budget. “Success by Design” means we do the job right. Stop by our inviting kitchen and bath showroom — open six days a week — or we’ll drop by your house to offer inspiration and gather measurements. The NDA Difference means your first design consultation is always on us. Let’s work together to complete your project to perfection. 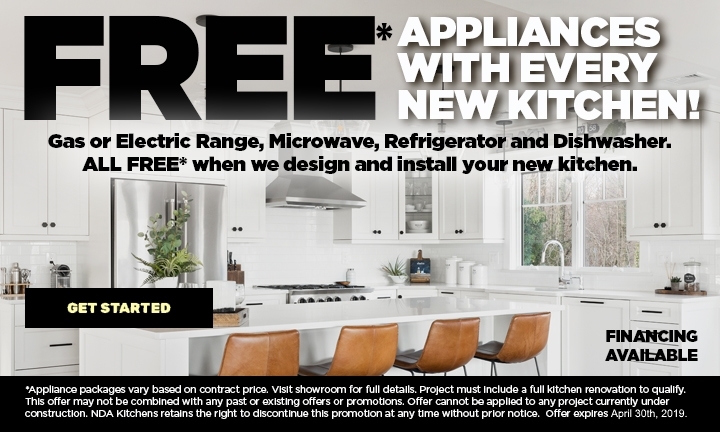 Get the kitchen you’ve always dreamed of. And now take $10,000 off to help make it a reality. Shop, compare, and save with the finest home improvement products and services all under one roof.